A RM2 company is the buyer of the country's most expensive piece of land. On Wednesday, Millennium & Copthorne Hotels plc (M&C), a company controlled by Singapore's property tycoon Kwek Leng Beng, sold 29,127 sq ft of vacant land in Jalan Bukit Bintang, Kuala Lumpur, to Urusharta Cemerlang (KL) Sdn Bhd for RM210 million, or RM7,209.80 per sq ft. The previous record in a reported land sale was RM2,588 per sq ft for Wisma Angkasa Raya in Jalan Ampang in 2008. A search at the Companies Commission of Malaysia revealed that Urusharta Cemerlang (KL) is owned by Tan Sri Zainol Mahmood and Shazni Sulaiman. The two have been its directors since 2006. Zainol is the chairman of Urusharta Cemerlang Sdn Bhd and Pavilion Kuala Lumpur Sdn Bhd. 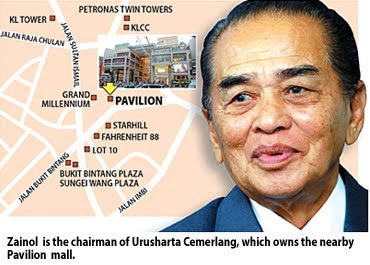 Urusharta Cemerlang owns the Pavilion Kuala Lumpur shopping mall, which is also located in the Bukit Bintang area. Urusharta Cemerlang is 51 per cent owned by Urusharta Cemerlang Development Sdn Bhd and 49 per cent by the Qatar Investment Authority(QIA). Not much is known about Shazni. In the financial year ended December 31 2009, Urusharta Cemerlang (KL), which is described as a dormant company, had current liabilities of RM5,010 and posted a net loss of RM1,305. Real estate agents are describing the latest deal as "dizzying heights" and reckon that it could take many more years to surpass the figure. But observers are wondering how and who will finance the acquisition given that the buyer is a RM2 company. They also questioned whether QIA will later participate in the deal and what will be built on the land - an extended retail mall or luxury residences. A mall would make sense given the land's proximity to Pavilion. However, at such a price, there is no doubt it could take more than the usual eight to 10 years to see a return on investment should a shopping complex be built. It might recoup the investment faster if it built and sold high-end residences. After all, the land had been initially slated for the RM500 million Millennium Residences project. In a statement issued in Kuala Lumpur on Wednesday, M&C said a 10 per cent deposit had been paid to its wholly-owned unit, CDL Hotels (Malaysia) Sdn Bhd, which owns the land. The deal confirms a Business Times report early last month that a land deal was being negotiated by CDL Hotels which could fetch a record price of over RM3,000 per sq ft. The latest deal is nearly three times the price paid per acre in several private sales of nearby land, and the highest ever in the country's history. "This transaction has obviously set a new benchmark in the local property market. I view the transaction as a special transaction as it is a special purchaser - an adjoining property owner who probably places more value on the asset than others," said a real estate agent, who declined to be named. It is understood that the YTL group, which owns the nearby Starhill Gallery, Lot 10 Shopping Centre and JW Marriott Hotel, had also been eyeing the land. The deal is expected to be completed no later than the second quarter of 2012. M&C's carrying value of the land was RM42.8 million. Based on this, the sale is expected to result in a pre-tax profit of RM164.1 million after taking into account transaction costs.